I don’t have much to show this week as I’ve been working on a bracelet that has several components so it’s a bit time consuming. 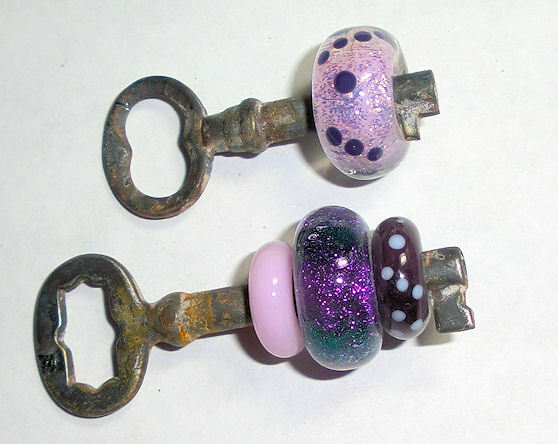 I did get some glass beads made on skeleton keys. I really like to make them. It’s fun to have the beads move around. Because I’ve been playing with dichroic glass, these both have a bead made with it. Okay, a sneak peek at my bracelet. I have three components done so far. I still have two more components and a clasp to make. This probably won’t be the order they go in when I finish the other components, I just wanted to see what they looked like linked together.